2014 has been an extremely busy year for Facebook. The company has changed advertising policies, redesigned layouts, introduced new mobile apps, cutback on post spam and more. It’s newest endeavor, a real-time newswire feed, will attempt to make the platform more useful for journalists, though there will be benefits for everyone else. This post will explain what FB Newswire will do and how it will help businesses, journalists, and everyday users. In essence, FB Newswire is a special, real-time news feed that contains original posts about newsworthy events. There are so many things being posted on social media, it’s hard to find original, accurate reports. FB Newswire seeks to cut through the noise through a partnership with Storyful, a news agency recently bought by Fox News owner, News Corp., that works to verify or disprove breaking-news reports that fly around social media. FB Newswire is accessible on Facebook at Facebook.com/FBNewswire. Though the service is primarily aimed at journalist, there is a benefit for everyday Facebook users. So much content is shared and reposted on Facebook, it’s often hard for people to verify the origin of information and posts. FB Newswire would function as a source of original content. It will also help people who want to keep up with major events around the world like protests, elections, and sporting events. There is also a clear benefit for business owners. 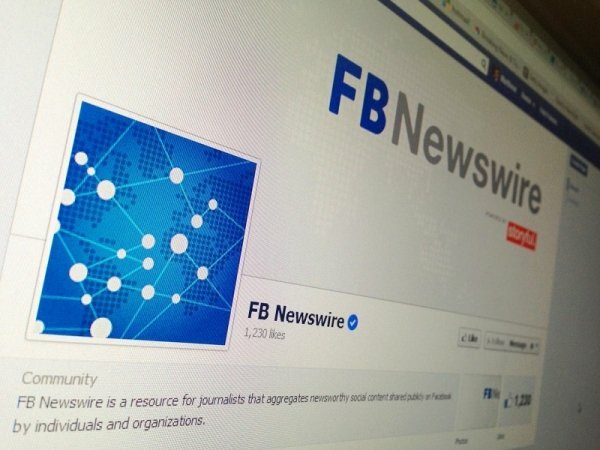 The FB Newswire is looking for newsworthy, original content to place on its feed. Business owners and marketers can use this to their advantage. For example, a brand that is at a major trade show can post pictures on their Facebook account and they might get picked up for the FB Newswire. Similarly, businesses that are attending major events can gain additional exposure for themselves if they creates newsworthy, original content at events FB Newswire is following. In some respects, the FB Newswire is a challenge to Twitter, which has thus far been the goto source for real-time information. Teaming up with Storyful may give Facebook an advantage, since the content on FB Newswire will be verified, which may make the service more reliable than Twitter. Ironically, or in an acknowledgement that many journalist use Twitter to search for news sources, Facebook is also providing a Twitter feed, @FBNewswire. “We work closely with our news partners and as we look at the opportunities clearly Facebook was being used as a place to gather news,” Mitchell said in an interview with Reuters. FB Newswire has the potential to make it much easier for these news partners to use Facebook to search for original content related to events in the news. At only a week old, Facebook already has more than 120,000 followers on its Twitter page, so the service may catch on. As marketers learn more about how the system works, be on the look out for ways to get original, newsworthy content from a brand featured on the news wire. So long as Facebook continues to listen to the concerns of its news partners, the FB Newswire feature will be extremely useful for consumers and journalist alike.